The fashion-short movie depicts a young girl’s journey to the realms of her deepest imagination. Producers: Eclumes Studios in collaboration with LaPac, Cheese & Chocolate Film SA, Kamerawerk, Swisshelicam.com, BSV Productions, Fotogen, Creative Docks. “Swiss” is a Creative Short Film Commercial for Swissair Directed By Tim Hoppin, Creative Director at Publicis, Zürich Area, Switzerland. Los Toneles Winery in Mendoza, Argentina. Director James W Griffiths received a 2014 BAFTA award for Short Film for Room 8. Prada teamed up with the legendary director Wes Anderson to present an eight minute short film. 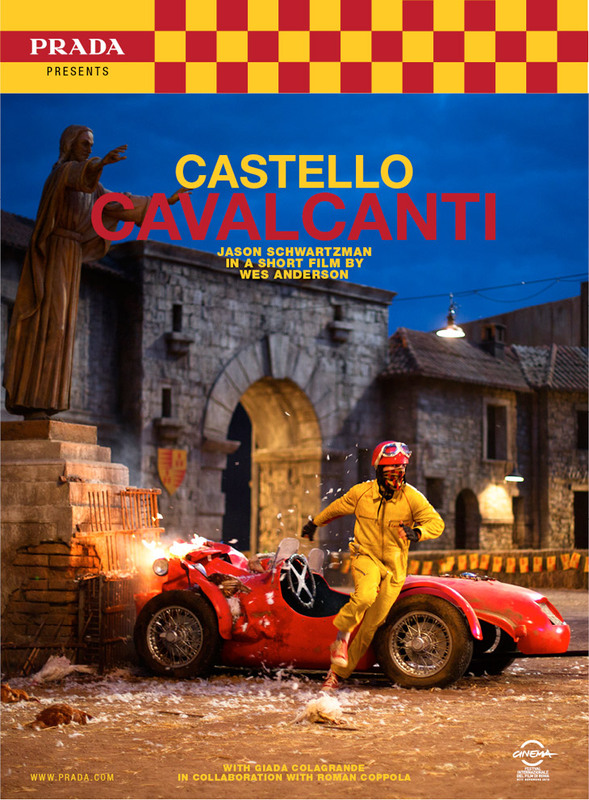 Castello Cavalcanti starring Jason Schwartzman who as the story unfolds crushes his car into a statue of Jesus Christ, is to become part of director’s classics such as The Royal Tenenbaums, The Darjeeling Limited and Moonrise Kingdom. Castello Cavalcanti short film comes after Prada’s 2012 collab with Roman Polanski who delivered the much talked about A Therapy, starring Helena Bonham-Carter and Ben Kingsley. It debuted at the Rome Film Festival on November 13th 2013 as part of the “Special Events Out of Competition” section. A story of a war waged on imagination. A painter’s resistance, courage and spirit can never be imprisoned in this highly stylized story of the conflict of two frustrated artists on either side is Israel’s militarized borders. Inspired by the creative journey of renowned Palestinian artist in exile Hani Zurob and on true stories and testimonies from the region, we witness expression, confinement, torture, jealousy, courage and freedom as both artists from each culture strive to paint a picture of life surrounded by conflict. Directed by Jessica Habie, her first feature film. Her documentary works Beyond Blue and Gray and Art and Apathy received awards at several film festivals including Tribeca Film Festival, The Cannes Short Film Corner, and Berlinale Talent Campus. Produced by Baher Agbariya. Thirst (Attash) 2004, Last Days in Jerusalem (2011), Man Without a Cell Phone (2010), Omar (2013). Edited by Luis Carballar Amores Perros (2000), Manorca (2008), Sin Nombre (2009), The Devil’s Double (2011), Immigrant (2012). Sound Design by Martin Herndandez, Amores Perros (2000), Babel (2006) Into the Wild (2007), The Loneliest Planet (2011) On the Road (2012). Starring Ali Suliman as Khaled, Paradise Now (Golden Globe Winner for Best Foreign Film (2005), The Lemon Tree (2008), Pomegranates and Myrrh (2008), The Attack (2012); Guy El Hanan as Eyal, An Israeli radio personality and an accomplished playwright and; Haale Gafori as Azzadeh author of the original poetry featured in Mars At Sunrise.